I finished my bedroom yesterday, like I mentioned, and honestly, I got so excited with how it looks that I took pictures to show all of you here. I think this is the cleanest my bedroom has been since I moved in and I just love how it looks. I slept so well last night. I can't wait until every room in my house looks this good. 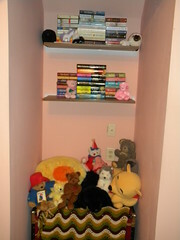 This is my alcove. It sits right between two closets and I have no idea why it's there, but it was crying out for these shelves. I'm proud to say that I hung them all by myself..and it also reminds me to add a stud finder to my household wish list. 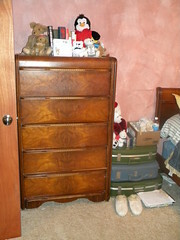 The other picture is my dresser. It's an antique that belonged to my great-grandparents and I love it. The suitcases stacked beside it act as a night stand for that side of the bed. I want one more to bring it up but haven't spotted one in a thrift store in a while. And it's been a bit since I've shown you pictures of my babies. As you can tell, the kittens were thrilled that mom was cleaning the bedroom. 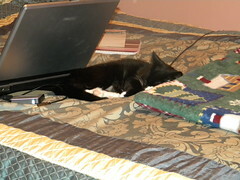 As soon as I finished tidying the bed, Mittens curled right up in the warm spot behind the laptop and went to sleep. 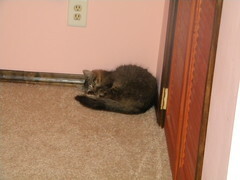 Her brother, Hemingway, on the other hand, chose the corner by the closet and took a nice long nap. I still cannot believe that this is my bedroom. I swear it's like walking into a hotel room and I'm loving it! Now, I'm going to go find those candles and enjoy the tranquility. I hope all of you are finding time to take care of yourselves today. This is very good to see. Keep up the good work.